Pumpkin Pie Martini - A recipe from Savor California, the online showcase for extraordinary gourmet foods and beverages from California. 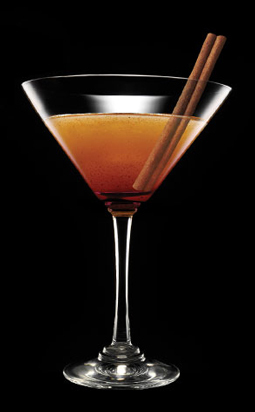 Vigorously shake all ingredients with ice in a shaker, strain into a martini glass and garnish with a cinnamon stick. * You can substitute 1-1/2 ounce of Sonoma Syrup Pumpkin Spice Syrup for the pumpkin purée and the Cinnamon Syrup. Sonoma Syrup Pumpkin Spice Syrup is seasonally available at Williams-Sonoma.